I still remember the first time I saw six-packs of Laughing Dog Brewing bottles in Bottleworks about 4 or 5 years ago. Since then, their bottles and taps have become a familiar sight throughout the NW. Their DogZilla Black IPA was the first version of the style that really knocked my socks off. 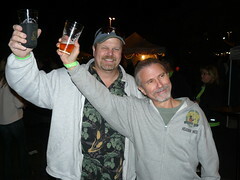 Their Hop Dog Harvest Pale Ale has continually impressed at the annual Yakima Fresh Hop Festival. The rest of their lineup ranges from the intense Alpha Dog Imperial IPA to a smooth Cream Ale that is a popular summer beer. According to this feature article in the Bonner County Daily Bee, owners Fred Colby and Michelle Douglass are celebrating their 5th anniversary this month by making plans to move into an even larger facility that will allow them to continue growing. The facility will allow them to produce up to 15,000 barrels of beer per year; not bad for a brewery that started off with just 200 barrels produced in their first year of business. The new Laughing Dog Brewery facility — currently under construction on Fontaine Drive immediately east of Highway 95 in Ponderay — will be filled in stages, the owners said. The first part of the business to make the shift will be the popular tasting room, which will be expanded to accommodate more customers, as well as live music and larger indoor events. The brewery itself should be completely relocated sometime between October and November. At 10,500 square feet, the new site will nearly triple the current location’s size. One of the first changes to come with the move will be the addition of more brewing tanks. With those in place, Colby estimated that Laughing Dog would be ready to reach a brewing capacity of about 10,000 barrels a year. Check out the full article for more details and commentary, and if you are in the area make sure to stop by the current brewery location for their 5-year Anniversary Pig Roast Competition. Six teams will roast pigs, and there will be professional judging and special beers.